Don't Forget to Enter the Shake Shack Giveaway! Happy Friday-- and happy Halloween, all! I'm just stopping by with a quick reminder for all of you: Don't forget to enter the Shake Shack giveaway! 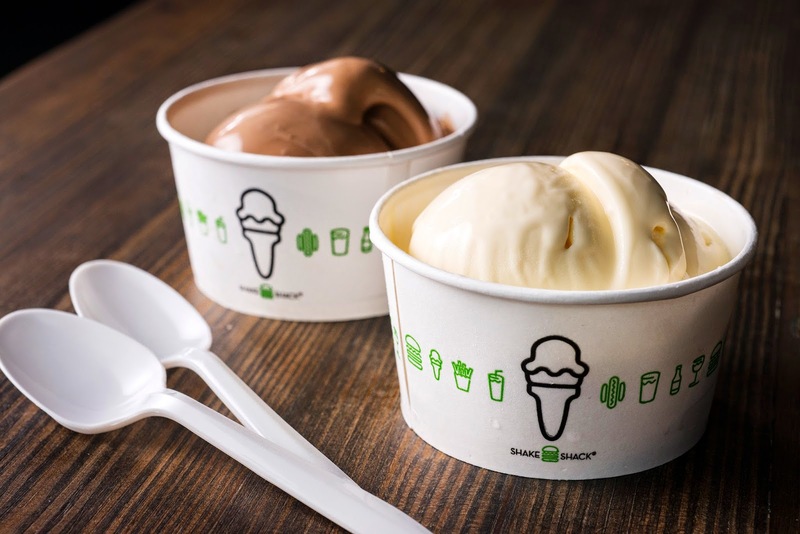 It ends tonight at midnight and there are several ways to enter to win 10 FREE frozen custards at the River North Shake Shack opening next week! P.S. 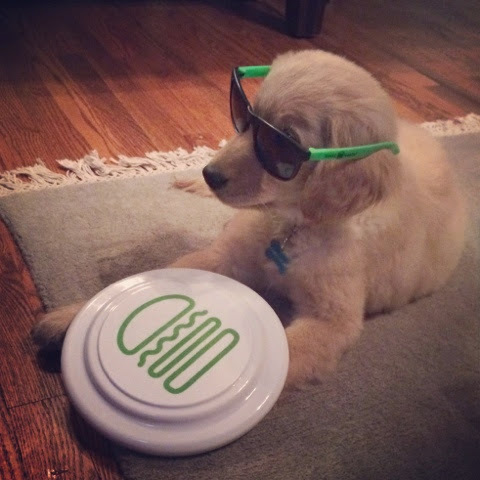 How cute is my puppy in his Shake Shack swag?! I am having a butternut squash moment right now. I love everything about this delicious squash-- it's hearty, good for you, can taste both sweet or savory, and is so versatile that it can be used in a wide variety of dishes. Plus, butternut squash is at its flavor peak during the fall-- just when you want to eat these hearty and flavorful dishes-- so this is the perfect time of year to cook with it! 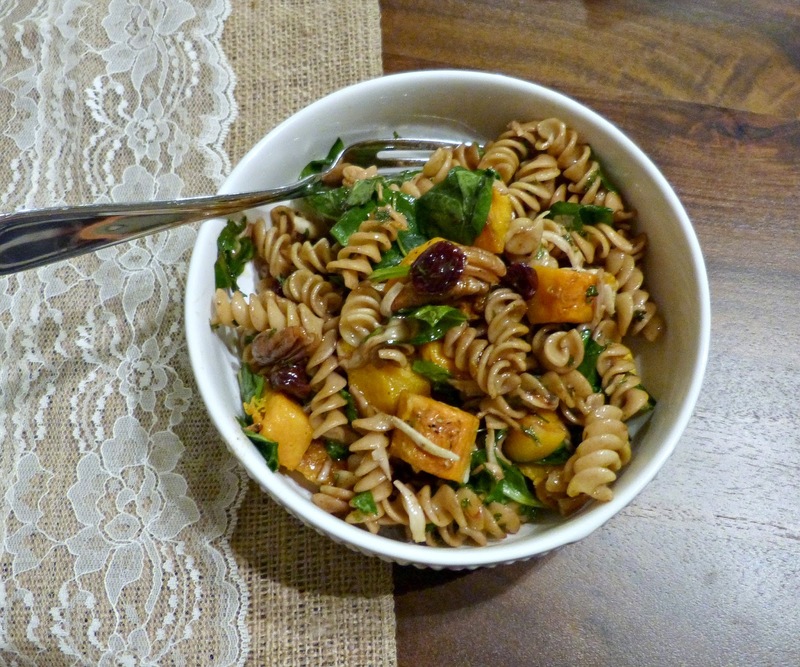 Today's recipe is a variation of a roasted squash salad recipe that I shared here recently-- with a pasta twist. I had many of the same ingredients left over after making that salad and not one to make the same dish twice, I decided to use some of these great flavors that work so well together and turn them into a healthy and filling fall pasta dish. In this recipe, whole wheat pasta adds a great nutty flavor and heartiness that you don't get from standard pasta. The pasta is dressed very simply with one my favorite pasta additions: extra virgin olive oil and balsamic vinegar. The pasta and the squash soak up the balsamic vinegar so the flavor of this dish is even better after being refrigerated and enjoyed for lunch the next day. This meal is meatless and truthfully, you don't miss the meat here because there are so many flavors and filling ingredients. If you need a little more protein here though, grilled chicken or some roasted and shredded pork would both be a really delicious addition here! Cook pasta according to package directions. Drain and immediately add to large bowl. Add olive oil, vinegar, salt, and pepper, and toss well to evenly coat the pasta. 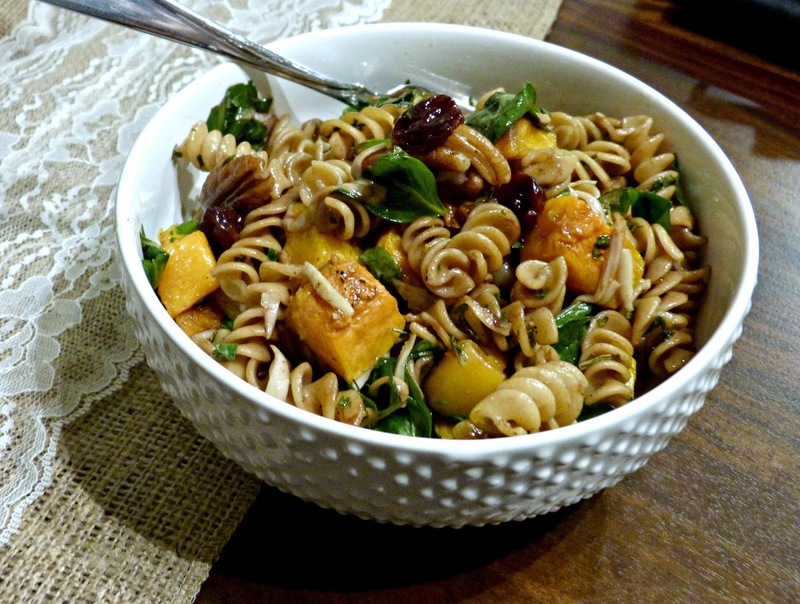 Add squash, spinach, cherries, pecans, and parsley to the bowl and toss to evenly distribute. 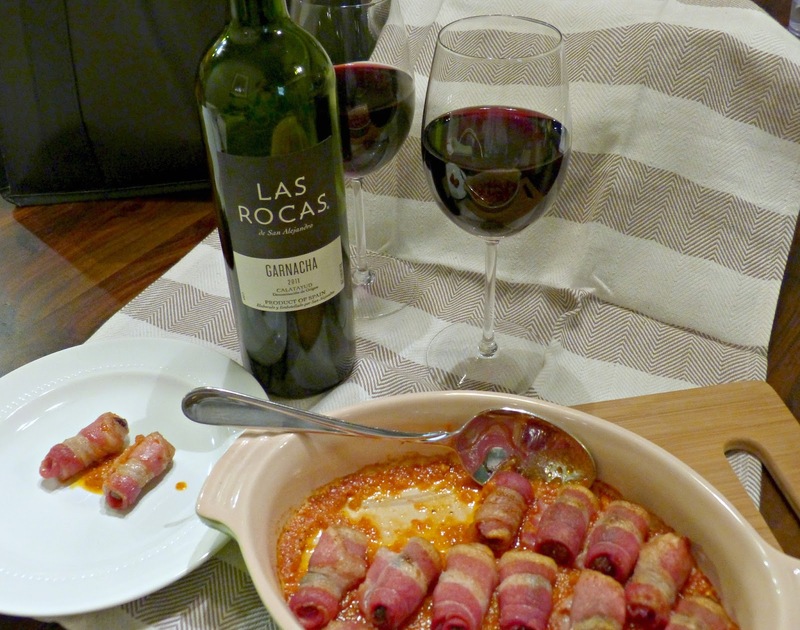 Top with grated Parmesan and serve immediately. Finally, Shake Shack Chicago... and a Giveaway! The rumors are true, people. At long last, Chicago is finally getting its very own Shake Shack! What is Shake Shack, you ask? Shake Shack is a fresh take on your typical fast food joint. 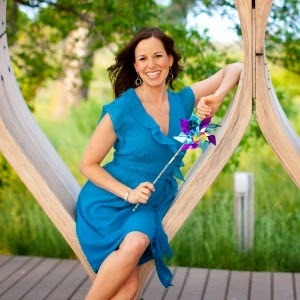 It began as a simple hot dog cart in Manhattan's Madison Square Park created by famed restauranteur Danny Meyer. He's the CEO of Union Square Hospitality Group and the man behind popular New York City restaurants like Union Square Cafe and Gramercy Tavern. The idea was to serve fresh and delicious burgers, shakes, and hot dogs like they did at old fashioned roadside stands and it quickly took off. New Yorkers have discriminating taste, it's true, but nobody can resist a really good burger-- especially when it is made with 100% all-natural Angus beef, no hormones and no antibiotics. Fast food you can feel good better about! 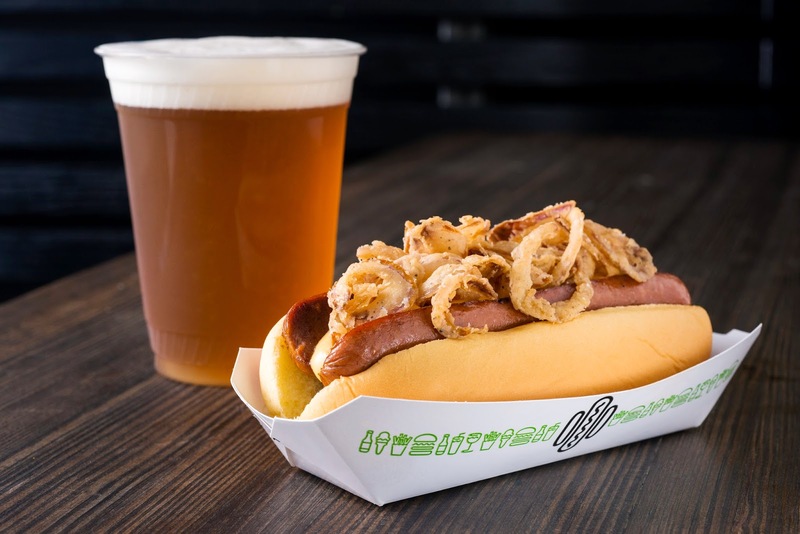 Shake Shack became a permanent fixture in Madison Square Park in 2004 and because it was so popular among Manhattan residents, other locations quickly popped up all over the city and then around the world. 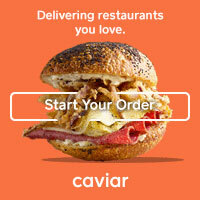 If you've seen the movie Something Borrowed, the characters are frequently seen enjoying a Shake Shack lunch while John Krasinski's character tries to talk some sense into Ginnifer Goodwin, who is in love with her best friend's fiance. 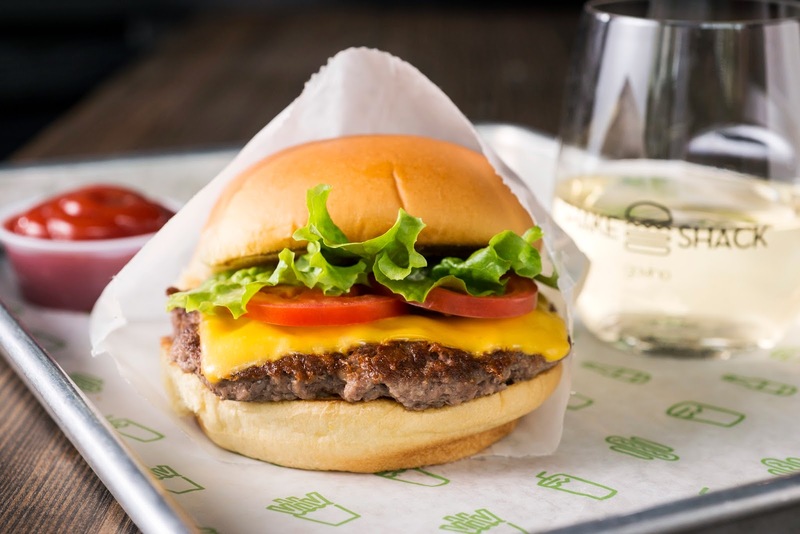 I am so happy to report that after DC, Florida, and New Jersey all got theirs, Chicago is finally getting its very own Shake Shack-- and conveniently located right off of the Magnificent Mile in River North. 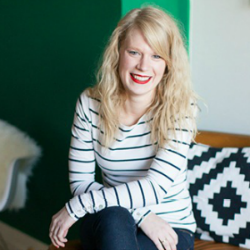 To celebrate their big opening, I'm offering a super fun giveaway today. In addition to their delicious burgers, hot dogs (like an apple and sage hot dog that's on my 'to try' list! ), and (duh) shakes, Shake Shack serves up one of my favorite frozen treats: Custard! 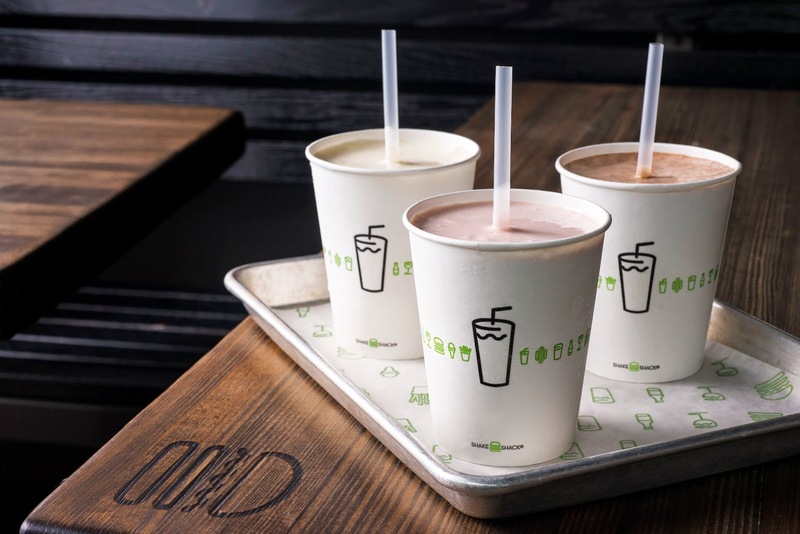 Even better, Shake Shack's custard is made with "real sugar, no corn syrup, and milk from dairy farmers who pledge not to use artificial growth hormones." As if you needed any more reasons to try it! And in addition to classic chocolate and vanilla, they feature a variety of special flavors each month too-- pumpkin pie, candied apple, and caramel walnut cake are all on the menu this month. Today I am giving away the chance for you to win 10 FREE frozen custards at Shake Shack's new River North Chicago location! Use the Rafflecopter widget below for multiple chances to enter. See you at Shake Shack! TGI Thursday, friends! I could use a glass of wine... and you? The Chicago Loop is packed with drinking and dining options from a variety of pubs and sports bars to fast casual places perfect for dining on the go to more old school fine dining spots perfect for the pre-theater or business dinner crowd. When I am meeting people after work though, there are a few things that I am looking for: a great drink list, a laidback atmosphere (I don't need to push through a crowded bar after a long day at the office), and some solid menu options for snacking. Today, I am sharing three spots in the Loop that check all of those boxes. 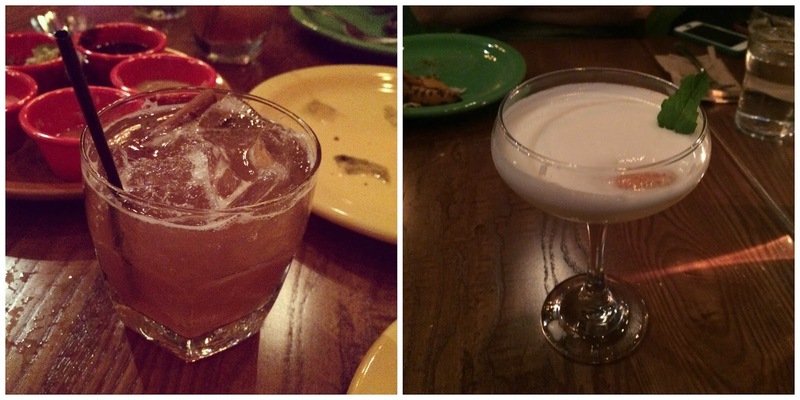 Check them out the next time you're headed out for happy hour! Despite it's prime location right on busy Wacker Drive, Hoyt's Tavern is a surprisingly low key tavern and lounge with great views for people watching and convenient location for travelers as it is in the ground level of the Wyndham Grand Chicago Waterfront (formerly the Hotel 77). Alex and I met up here after work one evening for a few drinks and some food and we were both pleasantly surprised by the menu. The menu focuses on Midwest ingredients and dishes that are traditionally served in this region, slightly elevated. One such item is the fried cheese curd. Alex and I began our love affair with fried cheese curds once we moved to Chicago a few years ago and have made it a mission to order them anytime we find them on a menu. Hoyt's preparation was particularly good. The white cheddar curds are locally sourced from Ellsworth Cooperative Creamery and were well seasoned and the crispy breading adhered to the curd (don't you just hate when they fall apart on you?). 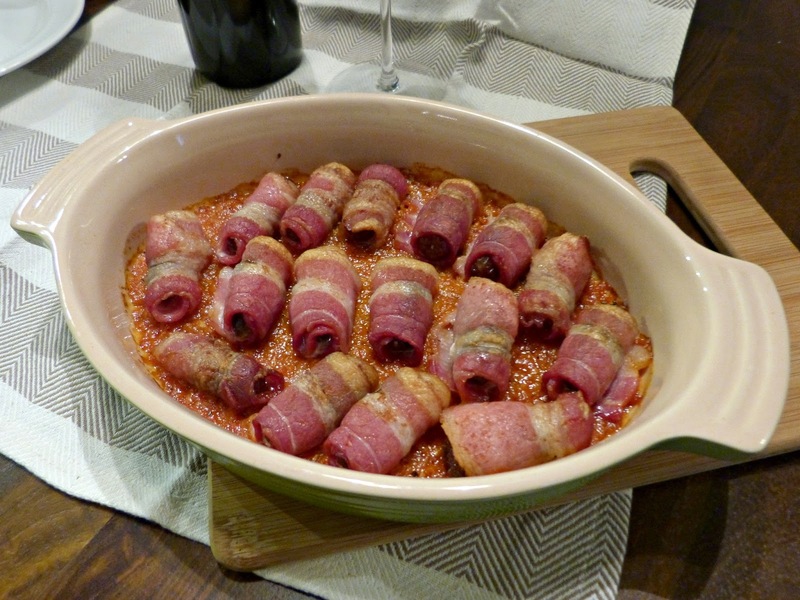 To top it all off, they were served with a deliciously smoky bacon ketchup and I could not get enough of it! I'm also a sucker for a good cheese and/or charcuterie plate-- especially when a restaurant puts their own signature twist on it. I loved pretty much everything on Hoyt's mixed board (you can also get separate cheese or charcuterie boards here too): Assorted meats from La Quercia (like duck prosciutto! 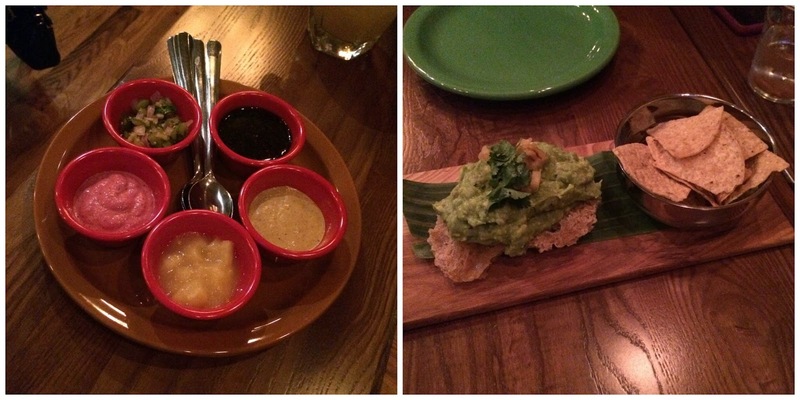 ), locally sourced cheeses, pickled veggies, crispy flatbreads, and my favorite part: condiments. I'm a firm believer that condiments can make or break a charcuterie board-- or really, any dish. This board included a delicious grainy mustard and a sweet date and whiskey compote that were super tasty and worked so nicely with the variety of meats and cheeses. Last, but not least-- a little something sweet. Until this evening, Alex had (gasp) never had monkey bread before so I made sure to order some at Hoyt's. Their monkey bread was sweet and chewy and served warm with a selection of three different dipping sauces (3 for 3 on dishes with great condiments! ): Salted pistachio caramel, mixed berry sauce, and my favorite-- a buttermilk anglaise. Rittergut is literally a hidden gem in the Loop. When my friend Alexis and I decided to meet up there after work (because we love a good wine flight), it took some time to find this place. Rittergut is tucked quietly into a building on Wacker Drive and opens up on to the Chicago River. Walking in, you feel almost transported into an old European wine cellar from the big modern building lobby you enter to get there. 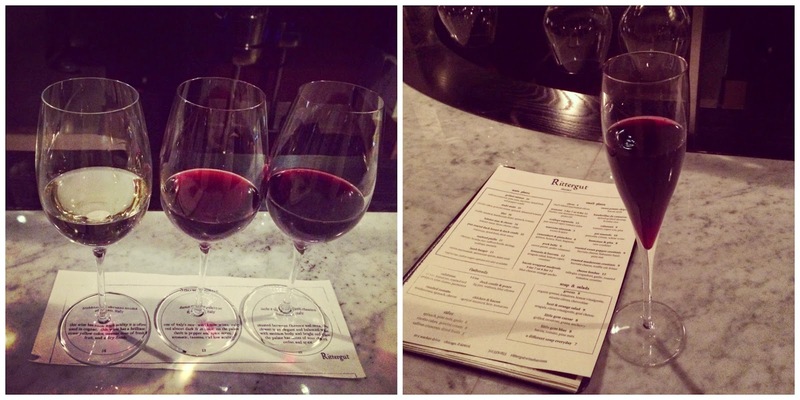 Rittergut serves an amazing selection of international and domestic wines-- from the familiar to the more obscure. The flights are themed-- by type, by region, or by season, and it was a really fun way for us to try some new to us wines. Rittergut is also where I was introduced to one of my new favorites: Lambrusco, a sparkling Italian red wine. 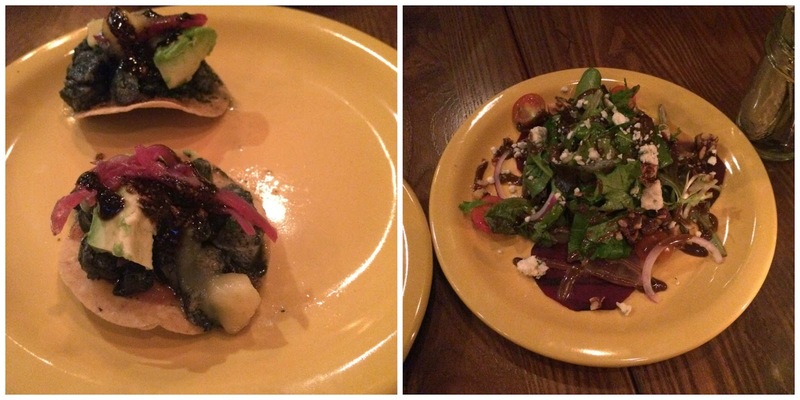 Rittergut also serves up a food menu with a little bit of everything-- small plates, flatbreads, and main plate entrees. Alexis and I decided to share a few snacks while we chatted over wine and started with one of my favorite appetizers: Arancini. At Rittergut these fried risotto balls are served with a fresh tasting San Marzano tomato sauce and a drizzle of flavorful basil pesto oil. I love that arancini are such a perfect mix of cheesy and crispy and gooey and the combination of brightly flavored sauces really balanced out that richness nicely. We also ordered a charcuterie plate here and were given the option to select our own assortment of meats and cheeses. Talk about overwhelming! 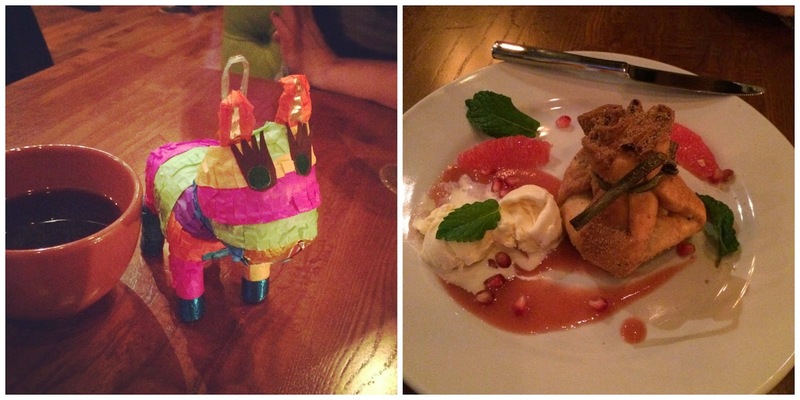 We had so much fun perusing the menu and selecting a few favorites and a few new items to try. The highlights for us were definitely the jamon Serrano (with manchego cheese, of course), the stagberry-- and elk salami with blueberries and honey, and a super creamy and funky French blue cheese. Newer to the Loop bar scene, Randolph Tavern has quickly become a popular spot amongst the work, tourist, and theater crowds because of it's uber convenient location (right at the corner of Randolph and Wells), it's huge space, and it's wide variety of food and beverage options. I stopped in for lunch with colleagues on a day that happened to be during one of the big World Cup matches and as you can see in the photo below, Randolph Tavern was the place to be! The menu here is part Midwestern pub fare and part southern smokehouse/BBQ joint. 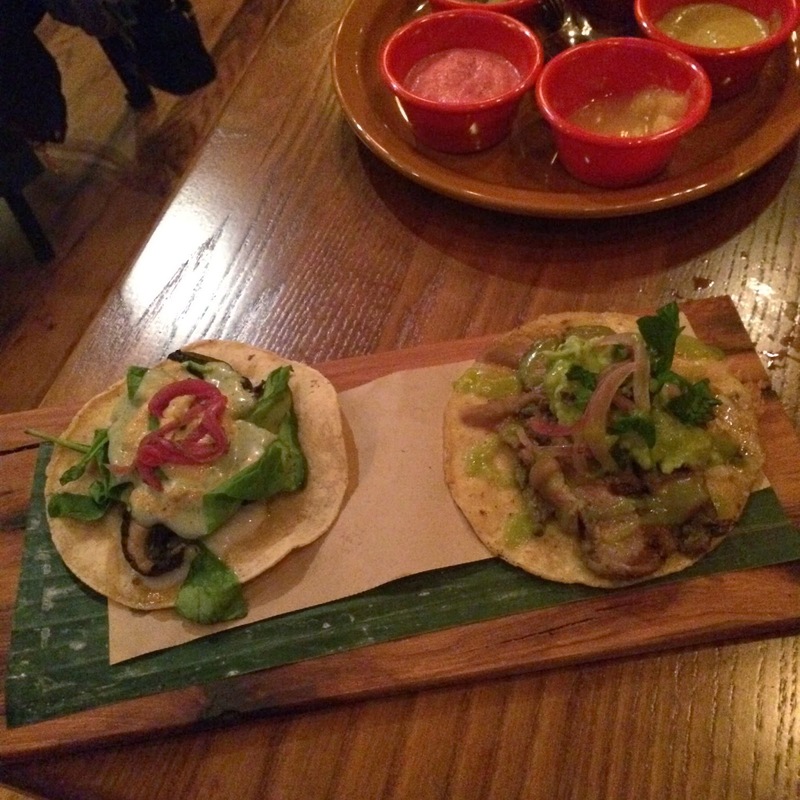 With that in mind, I decided to order the smoked chicken & avocado tacos. Four tortillas were piled high with tender smoked chicken, generous slices of avocado, a tangy cabbage slaw, and were topped off with Randolph Tavern's sweet and smoky root beer barbecue sauce. It was a perfect lunch and would be the perfect happy hour snack for sharing too! 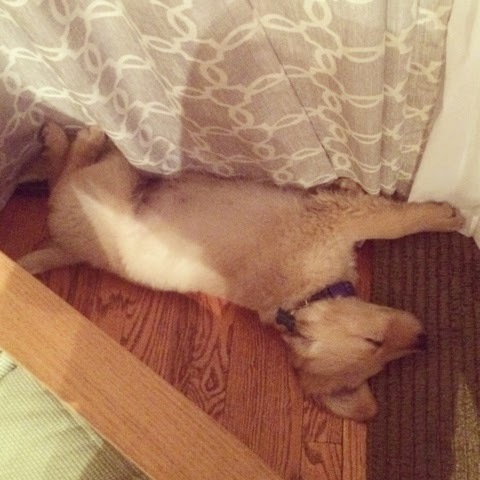 I know that many of you dog owners out there warned me of this, but I just need to say it: Puppy parenting is hard work. Between a dozen trips in and out of the building to go potty to cleaning up a variety of accidents to midnight barking from the crate and 5 AM wake up calls... the past 10 days have definitely been an experience. And I am just exhausted. God bless you readers with human babies. 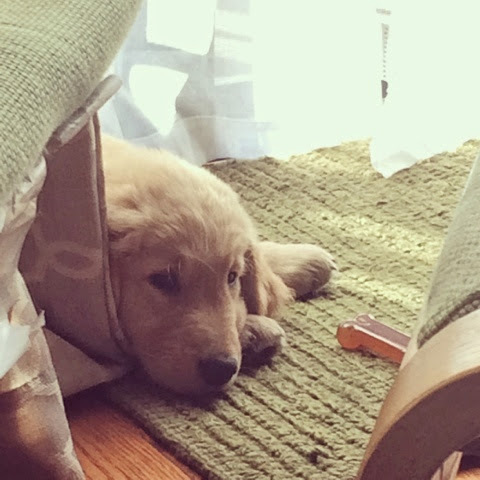 It's a good thing that Clery is so darn cute and all in all, a really well behaved puppy. It's also a good thing that I own a slow cooker because I have been relying heavily on it lately. This kitchen appliance can sometimes be the only thing standing between serving a homemade dinner or picking up a takeout pizza on my way home from the office. 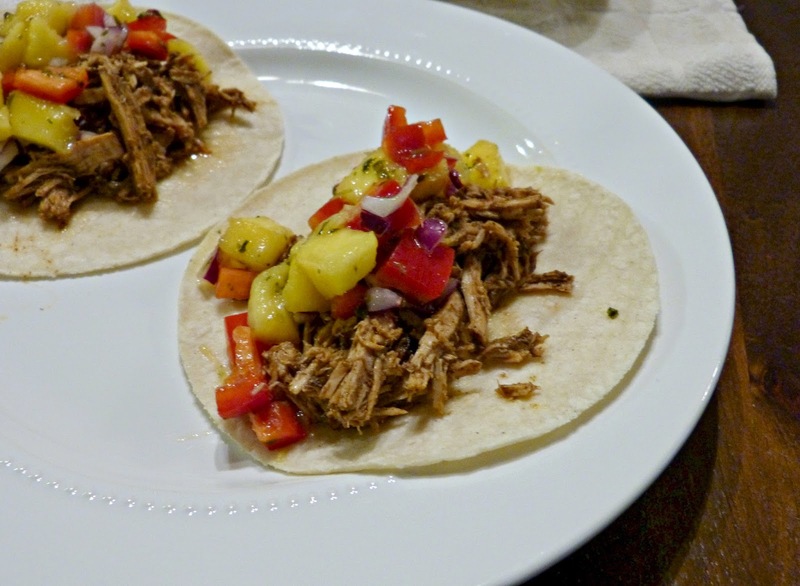 These jerk pork tacos are a fresh and easy way to make a complete dinner with very little hands on prep time-- you know, so you have time to do other things like pry rocks out of your puppy's mouth or roll a tennis ball his way 35 times in a row. This recipe is a fun twist on your standard taco night recipe with complex spicy and slightly sweet Caribbean flavors from a variety of spices and a combination of dark rum and apple juice. The pork cooks low and slow all day in the slow cooker and then all you need to do is shred up the pork and assemble your tacos. Topped with an island-inspired salsa of fresh mango and sweet bell peppers, these tacos are both easy and impressive. This pork would also be great on a bun with a sweet slaw or even over rice with roasted veggies and this mango salsa on top. In a small bowl combine all dry ingredients from onion powder through cayenne pepper. Rub spice mixture all over pork. Heat oil over medium-high heat in a large skillet or in your slow cooker if you have a multi-function slow cooker. Sear the seasoned pork until browned on all sides. Place the pork in the slow cooker and pour the apple juice and rum over pork and add bay leaf. Cook on low for 8 hours, turning the pork a few times throughout if possible. Remove the pork from the slow cooker, shred with two forks, and then add back to the liquid in the slow cooker. Toss to evenly coat. In a medium bowl, combine mango, bell pepper, onion, cilantro, lime juice, salt, and pepper. Stir to combine. 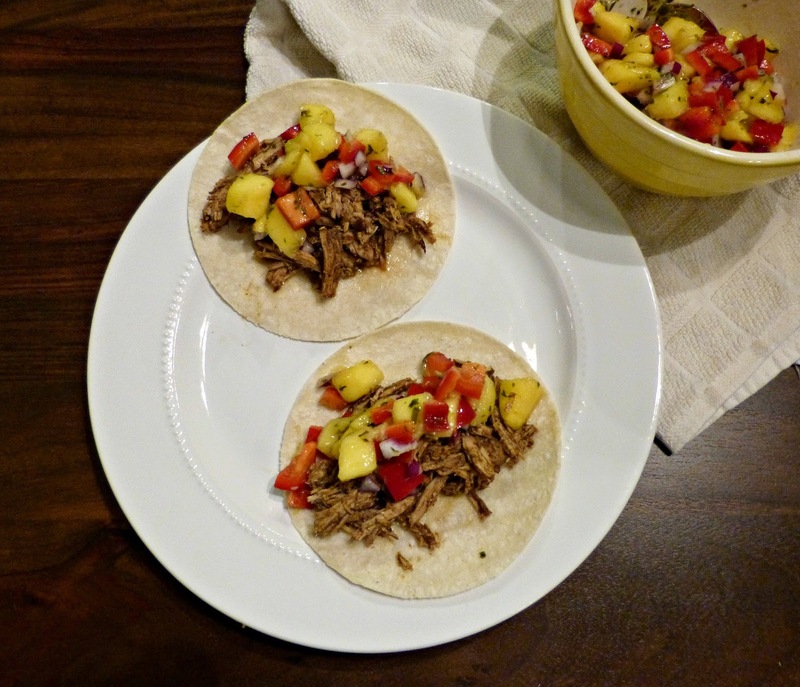 Top each tortilla with warm pork from the slow cooker and finish with mango salsa. Serve immediately. Derived from recipe by Mother Thyme. If you follow me on Instagram, you may have seen these photos already but today I wanted to introduce you to the newest member of my little family: Meet Clery! Clery officially moved in with us this past Saturday. He hasn't even lived with us for a week, but we are both totally smitten with him already. 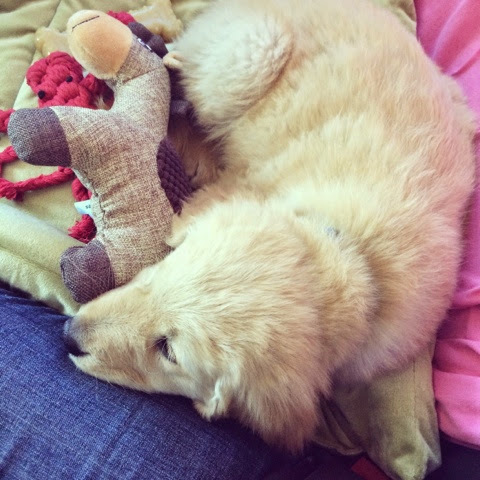 He already has a very definite personality-- he's goofy and sweet and he loves to play and he loves people. He will stop and let anyone pet him when we're outside. Clery will sit down and wait for an approaching human to ooh and ahh over him and give him a quick pet and seems genuinely offended when they aren't interested in him. 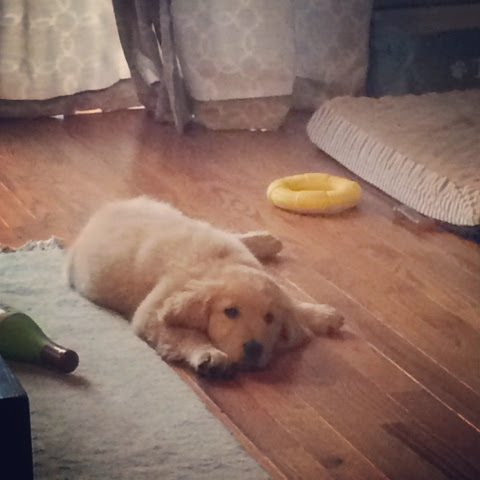 He's also remarkably calm for a 10-week old puppy. He isn't super jumpy and he really only barks when he's scared or needs something. He was doing really well with walks the first weekend we had him-- we took him all around the neighborhood and he only got a little shaky and scared when he was near more major streets with lots of cars and loud noises. It's definitely not a big surprise seeing as the first 2.5 months of his life were spent in a quiet house in a suburban Michigan neighborhood. 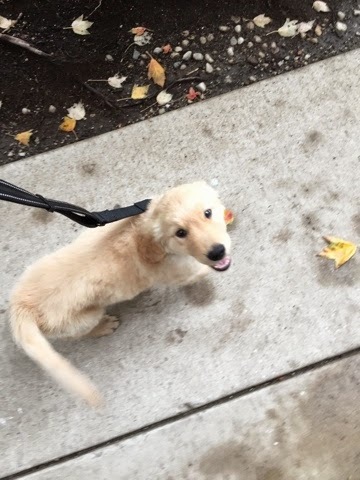 City life is a big change for this little guy! Sadly, he had a big scare a few days ago with a nasty little Boston terrier in our building that I have since found out from my neighbors "hates other dogs." Always the kind of dog you want your puppy sharing an elevator with, right? 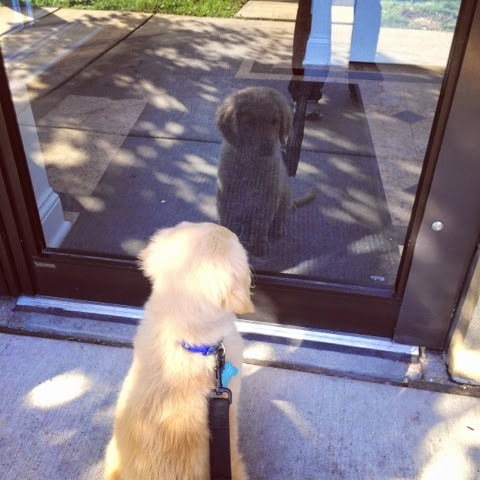 Clery has been super scared to go out on walks past our building since that happened, but we are working on it... he's bound to be Alex's running buddy soon! 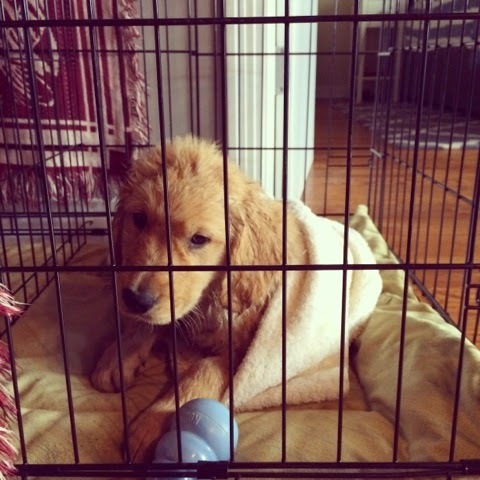 He's also adjusting to crate life and although we've had some accidents and some crying when we leave for work, we are constantly surprised by how trainable Clery is proving to be. He recognizes his name and a few commands. We're also trying to teach him to ring a bell on our front door to let us know he needs to go out-- and he already has a few times! 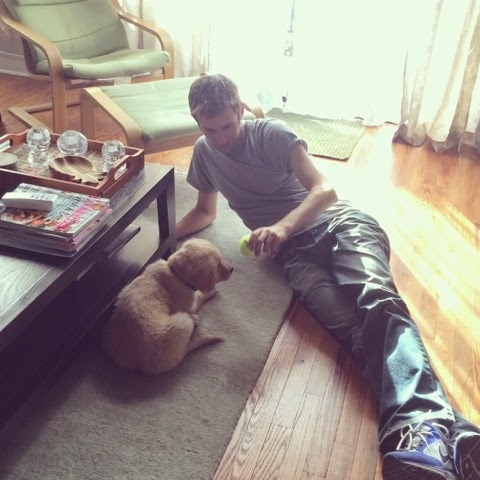 I love how calm this little puppy is, but more than anything I love how much he loves to cuddle. This dog loves to play fetch and chew on anything squeaky, but he also loves to climb into your lap or to be held like a baby. It makes me love him even more-- especially knowing that since he already weighs about 15 lbs. that our days of cradling him like a baby are numbered! Clery loves eating-- anything and everything including tree bark leaves, and acorns, which led to a scary amount of dog puking the first day we had him! Aside from mini Milk Bones though, pumpkin puree and cheese are a few of his favorite treats. He gets frozen pumpkin in his Kong when we have to crate him and we use chunks of cheese to lure him down the street in an effort to get him used to city walking. The first is working much better than the latter, though he still loves the cheese! 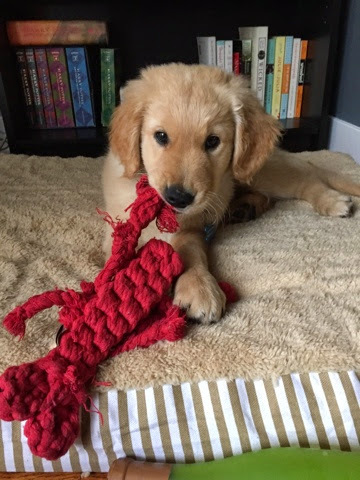 Clery also loves his new dog walker, giving kisses, his squeaky Chardonnay chew toy and his lobster rope toy. He loves eating ice cubes, sitting on our deck and watching cars go by (from a distance, of course), big gentle dogs that want to meet him, sleeping in, on, and behind our living room drapes, and any TV show involving a song, dog barking, bird chirping, or sports. Clery does not enjoy taking baths, walking on a leash, small jumpy dogs, city noises including cars, sirens, or dogs barking in the distance, wearing a harness (though we have tried), riding the elevator, or being in his crate when we leave for the day. He's a good boy though and I'm confident that with a little more work we will get over all of that! Want more Clery? Follow me on Twitter and Instagram or look for #clerycolvin on either one!